If you made it past the title and are reading this post, you took the first step towards one incredible cookie. This isn’t an April Fool’s Day joke. This is one delicious cookie even with the secret ingredient. I have had many, many taste testers try these. I may have forgotten to tell them that these Squash Lemon Drop Cookies had squash in them. Actually, I’m pretty sure that I did. After three or four cookies each, my taste testers still couldn’t guess the secret ingredient. I sat there smiling inside. It was my little secret. This lemon cookie recipe combines two great recipes–a hearty squash recipe and my favorite lemon cookie recipe. Once your family falls in love with these Squash Lemon Drop Cookies you should have them try some yummy broccoli brownies. Your family will never have more fun eating their veggies! 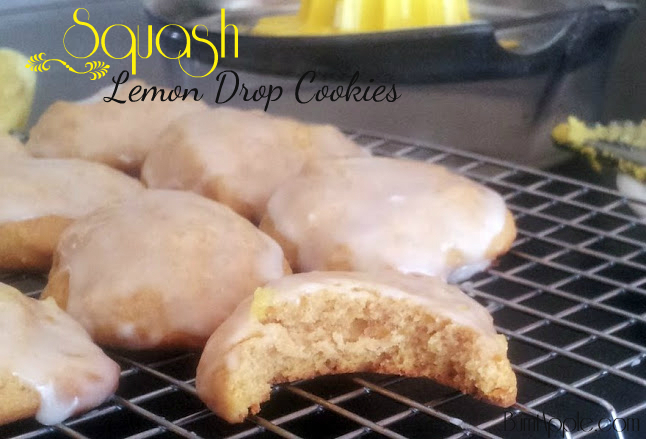 Delicious lemon drop cookies made moist and delicious with the help of a secret ingredient--squash. In a bowl, combine the raw sugar and squash. Stir to combine, then set is aside while you prepare the rest of the cookies. Poke several holes around the butternut squash. Place the squash on a microwave safe plate and cook in the microwave on high for 11-15 minutes. The squash is done when it is tender to the touch. Remove the squash from the microwave and allow to cool. Cut the skin of the squash off, then open and remove seeds. Place the squash in a food processor or blender and blend until smooth. Pour the squash into a cheesecloth lined colander and allow liquid to drain for approximately half an hour before using. Drop dough by rounded tablespoons onto the cookie sheet, leaving a couple of inches of space in between each cookie. Bake for 11-13 minutes or until cookie becomes lightly browned. Remove from oven and allow to cool completely before frosting. In a bowl, mix together the flour, baking powder and salt until combined. Set aside. In the mixing bowl, beat the butter for about one minute on medium speed. Slowly add the cane sugar and zucchini mixture and mix on low until blended well. Add the flour mixture, vanilla, lemon zest and milk and continue stirring until combined. Combine 1/2 cup powdered sugar, 1 tbsp of milk, 1 tbsp of lemon juice and 1 tsp of lemon zest in a bowl and stir to combine. Dip the tops of each cookie in the glaze and allow glaze to set before eating. * 1/2 cup white sugar can be substituted for the raw sugar Recipe adapted from Natural Health. Love anything with lemon – these looks delicious! Thanks so much for sharing at Finding the Pretty & Delicious Linky party! I love lemon cookies. I’ll have to try those, but I may not share them with the kids LOL.